Unser 4-Jahreszeiten-Blockhaus (Bj. Erbaut 2002) ist auf einer Sackgasse in einem ruhigen Abschnitt entfernt von den wichtigsten Straßen in der Chimney Hill Resort Gemeinschaft. Es ist voll möbliert 3 Schlafzimmer, 2 Badezimmer und kann 9+ Personen (Master (up) Etagenbett Zimmer, Queen-Size unteren und Dachboden Schlafbereich) schlafen. Es ist ein perfektes Wochenende für Familien oder Gruppen von Freunden zu unterhalten. Die Einrichtung ist rustikal und gemütlich, mit einem Rundumterrasse und die Verwendung eines Speckstein Holzofen während der Wintermonate. Es ist ein teilweise fertig Keller mit einem Großbild-TV und Tischtennis. Zu den weiteren Annehmlichkeiten für Ihren Komfort gehören ein Außengrill, Full-Range-Herd, Mikrowelle, Highspeed-Internet, Waschmaschine, Trockner und Kühlschrank. Die Kabine wurde auf zwei Lose gebaut und Rücken bis zu den grünen Bergen. Das Clubhaus Angebote gehören Innen- und Außen (saisonal) beheizte Pools, Whirlpool, Tennis, Boccia, Basketball, Hufeisen Grube, Shuffle-Board, Billardtisch, Tischtennisplatte und ein Spielzimmer für die Kinder und Junggebliebene. Es gibt auch ein Lesen und Wohnbereich mit WI-FI. BYOB Bar und Küche mit Blick auf den Innenpool und Whirlpool. Öffnen Sie den Einsatz Grills und Decks mit Tischen im Freien. Natürlich gibt es einen großen Flachbild-TV-Raum (Freitag Abend Filme für die Kinder) und ein Kinderspielzimmer. In den Wintermonaten gibt es eine präparierte Eislaufteich und Erwärmung Hütte (voll mit Second-Hand-Skates verpackt. Die V. A. S. T. Schneemobilwegen können auch direkt von unserem Standort zugegriffen werden! Den Berg hinauf (ca. 5 Fahrminuten), erhalten Sie die Haystack Wanderweg Eingang und eine gut bestückte Forellenteich finden. Genießen Sie einen ruhigen Spaziergang durch die Innenstadt von Wilmington historischen Dorf mit seiner charmanten Restaurants und Geschäften nur eine Meile entfernt. Kommen Sie den Spaß und Komfort unserer Gemeinschaft bietet. Wir sind 7 Meilen von Mount Snow Ski Resort mit Ski / Snowboard, Skischule / Kindertagesprogramme, Schläuche, szenische Liftfahrten und Mountainbike Downhill. Mount Snow präsentiert auch die "Tough Mudder" und verschiedene saisonale Feste. Sie sind auch in unmittelbarer Entfernung zu Antiquitäten und Outdoor-Flohmärkte; Weinprobe; Wandern in der Green Mountain National Forest; Twin Brooks Snowmobile Tours; Bootfahren / Binnenfischen am Lake Raponda und See Whitingham; Reiten; und Schlittenfahrten an Adams Farm. Wenn Sie ein wenig mehr Zeit haben, wagen sich für einen kurzen Tagesausflug nach Yankee Candle oder Bromley Mountain Ski Resort, ebenfalls mit einer Sommerrodelbahn und Erlebnispark in den Sommermonaten (eine Stunde entfernt). Vergessen wir nicht die Äpfel oder Ahornsirup. This house was perfect! So warm and inviting. Such a comfortable place for a wonderful family weekend. We will definately be back!! Great location and great weather for our trip. Great place to stay in Vermont! We had a great time staying in Wilmington at this cabin in the woods. The house was very clean and well maintained, and was the perfect place for our family to stay. The location is great, with the house at the end of a dead-end road, really surrounded by woods. From the house, you feel entirely surrounded by woods, and basically cannot see any other houses or the road. Yet the house is a very short drive into Wilmington and several restaurants and stores and just a 6 minute drive to the clubhouse with pools that were great for the kids. Everything in the house was as listed and as indicated in the pictures and listing. It was a very comfortable place to stay. When a minor issue arose (the propane tank for the grill ran out) the owner responded immediately and was very helpful to see that the issue was addressed, and he reimbursed us for the cost of the propane refill. All in all we had a wonderful weekend stay, and the house was great. I would definitely look to stay here again when we return to the area. The cabin was perfect! Excellent porch to relax on, the ping pong table was a huge bonus, the kitchen was well equipped, and the beds were comfortable! We will definitely be back! 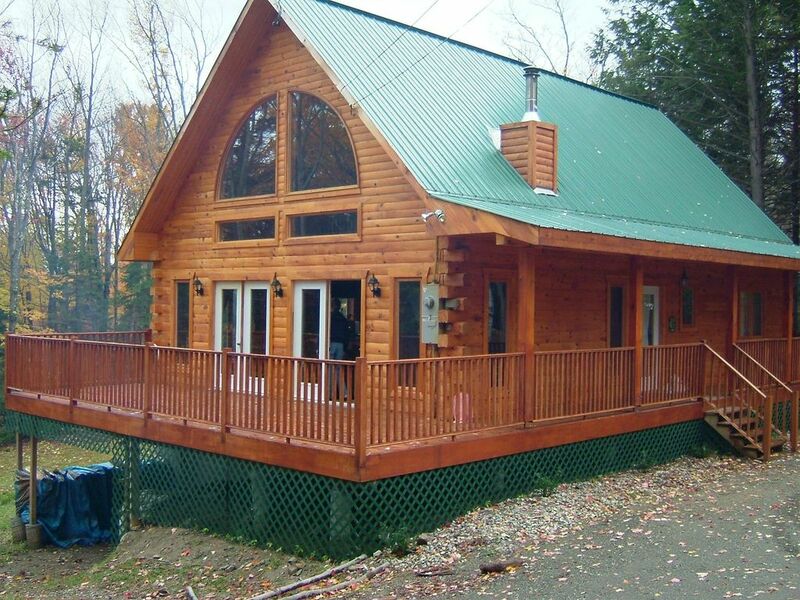 Wonderful Log Cabin Vacation in Vermont! My family and I stayed at the log cabin July 4th week 2018. We had an amazing time! The log cabin was exactly how the pictures showed it. It had everything you needed and more. It really made you feel like you where alone in the mountains but really you were very close to down town Wilmington and Mt Snow as well. We had a great week visiting family and uniting all the young cousins back together! Having the pool and club house was amazing especially because it was in the 90 the whole week. I would highly recommend staying here to anyone who is looking for a relaxed vacation away from the crazy city life or wherever you live! We spent the entire 2017/2018 ski season in this beautiful, perfectly situated, and comfortable log cabin. We felt right at home! It was perfect for our family of four, with plenty of space to accommodate friends and family who stayed with us during various weekends and holidays. The home is impeccable--clean, bright, and airy. The home really works very well for an active family. We loved the open concept of the living space and the kitchen had everything we needed to prepare our own meals--well kept appliances, tons of dishes, glasses, utensils, mugs, cookware, etc. The washer/dryer on the main level made doing laundry very easy. We also really enjoyed having the basement--complete with ping pong table, dart board, and huge flat screen TV which was a treat for our boys. The owners were wonderful and very easy to work with from the very beginning. We would absolutely recommend this home to anyone looking for a rental in the area. Seasonal Winter months require 4X4 wheel Drive Propane Tank will be filled week before arrival. Payment amount for propane usage will be paid week before leaving and will be whatever Propane Company charges to top off. Utilities will be placed in renters name before arrival.